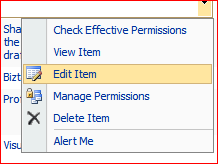 So, this is a new fact about SharePoint for me – HideCustomAction Feature element doesn’t work with the EditControlBlock. Normally, you add links to menus, toolbars, etc., using a ‘CustomAction‘, and hide them using ‘HideCustomAction’. Works a treat in most of the interface. Don’t know how I managed to avoid this problem for 4 years! Never felt comfortable injecting JS into SP pages… JQuery was a different chapter all together :D! !